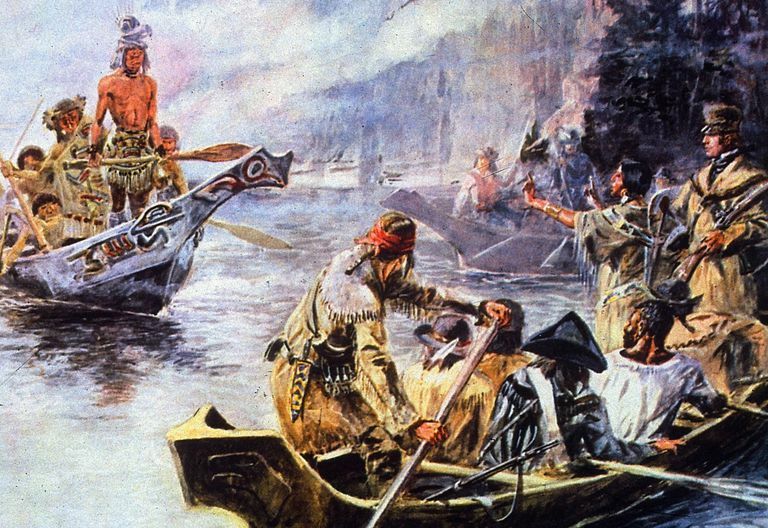 One member of the Lewis and Clark Expedition was not a volunteer, and according to the law at the time, he was the property of another member of the expedition. He was York, an African-American slave who belonged to William Clark, the expedition's co-leader. York was born in Virginia in about 1770, apparently to slaves who were owned by the family of William Clark. York and Clark were roughly the same age, and it seems likely they had known each other since childhood. In the Virginia society in which Clark grew up, it would not have been uncommon for a Caucasian boy to have a slave boy as a personal servant. And it appears that York fulfilled that role, and remained Clark's servant into adulthood. Another example of this situation would be that of Thomas Jefferson, who had a lifelong slave and "body servant" named Jupiter. While York was owned by Clark's family, and later Clark himself, it seems that he married and had a family before 1804, when he was compelled to leave Virginia with the Lewis and Clark Expedition. On the expedition, York fulfilled a number of roles, and it's apparent that he must have possessed considerable skills as a backwoodsman. He nursed Charles Floyd, the only member of the Corps of Discovery to have died on the expedition. So it seems York may have been knowledgeable in frontier herbal medicine. Some men on the expedition were designated as hunters, killing animals for the others to eat, and at times York functioned as a hunter, shooting game such as buffalo. So it's obvious that he was entrusted with a musket, though back in Virginia a slave would not have been allowed to carry a weapon. In the expedition journals, there are mentions of York being a fascinating sight to the Native Americans, who had apparently never seen an African American before. Some Indians would paint themselves black before going into battle, and they were amazed by someone who was black by birth. Clark, in his journal, recorded instances of Indians inspecting York, and trying to scrub his skin to see if his blackness was natural. There are other instances in the journals of York performing for the Indians, at one point growling like a bear. The Arikara people were impressed by York and referred to him as the "great medicine." When the expedition reached the west coast, Lewis and Clark held a vote to decide where the men would stay for the winter. York was allowed to vote along with all the others, though the concept of a slave voting would have been preposterous back in Virginia. The incident of the vote has often been cited by admirers of Lewis and Clark, as well as some historians, as proof of the enlightened attitudes on the expedition. Yet when the expedition ended, York was still a slave. A tradition developed that Clark had freed York at the end of the expedition, but that is not accurate. Letters written by Clark to his brother after the expedition still refer to York being a slave, and it seems that he was not freed for many years. Clark's grandson, in a memoir, mentioned that York was Clark's servant as late as 1819, some 13 years after the expedition returned. William Clark, in his letters, complained about York's behavior, and it appears that he may have punished him by hiring him out to perform menial labor. At one point he was even considering selling York into slavery in the deep south, a much harsher form of slavery than that practiced in Kentucky or Virginia. Historians have noted that there are no documents establishing that York had ever been freed. Clark, however, in a conversation with the writer Washington Irving in 1832, did claim to have freed York. There is no clear record of what happened to York. Some accounts have him dead before 1830, but there are also stories of a black man, said to be York, living among Indians in the early 1830s. When Meriwether Lewis listed the expedition participants, he wrote that York was, "A black man by the name of York, servant to Capt. Clark." To Virginians at that time, "servant" would have been a common euphemism for slave. While York's status as a slave was taken for granted by the other participants in the Lewis and Clark Expedition, the view of York has changed over the course of future generations. In the early 20th century, at the time of the centennial of the Lewis and Clark Expedition, writers referred to York as a slave, but often incorporated the inaccurate narrative that he had been freed as a reward for his hard work during the expedition. Later in the 20th century, York was portrayed as a symbol of black pride. Statues of York have been erected, and he is perhaps one of the better known members of the Corps of Discovery, after Lewis, Clark, and Sacagawea, the Shoshone woman who accompanied the expedition. Clarke's Laws: Is Advanced Technology Indistinguishable from Magic?